Whenever you are trying to direct an audience, your message needs to be clear as well as heartfelt. Asking for money is never easy, but if you can appeal to people’s emotions, you may have a better chance of getting them to donate to your cause. When constructing your call-to-action, use phrases like, “Help Us Build Our Mission”, or “Join Us In Our Cause”. Be careful not to say things like, “Give Us Money,” or “Donate Funds Immediately”. The latter two phrases are too stark and too harsh. When you ask for funds, your form should be as straightforward and easy as possible. Since you are already asking someone to give up their money, you want to make sure their giving experience is as simple as it can be. Get rid of unnecessary fields; and only keep the questions that matter. For instance, there is no need to include fields like, “What Is Your Annual Income?” or “State Your Reason For Giving”. Additionally, demographic questions like age, marital status, and ethnicity are not appropriate. In another effort to make donating as simple as possible, it is wise to display options for giving. For example, add radio buttons to your form so that people can check off, for instance, whether they want to give $10, $25, or $100. Just in case a person wishes to donate a different amount, you should include an option where people can enter in their own amount. You may also give people the option to donate on a recurring, monthly or yearly basis. People who intend to donate are obviously interested in your non-profit’s cause, so give them something to see! Use high quality images on your donation page, and make sure the layout is aesthetically pleasing. It would be beneficial to also display an image of how donations will help your mission. For example, say you are trying to collect donations to build a well in an underprivileged town. If this is the case, show an image of children taking advantage of the water from the last well your group funded. This way, potential donors can see just how vital their donation will be. 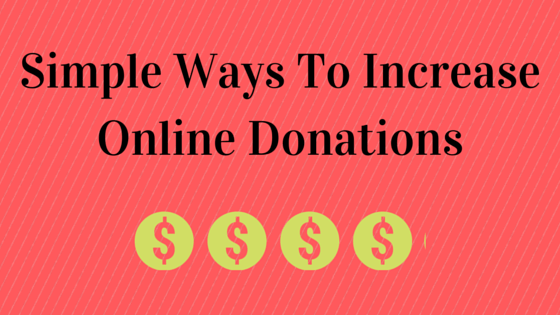 After you create an initial donation page, duplicate the page, and make some minor changes to it. Make both pages live, and see which one performs better. This is called split-testing. In doing this, you can find out which page is likely to get more donations. Perhaps try using a different image on each one, change the color of the CTA’s button, add an arrow pointing to something you want to emphasize, etc. Maybe it’s something as simple as changing one word in your CTA. You can find out a lot about what motivates people to donate money to your organization when you split test the pages. There is a really clever, and cost-efficient way to drive people to your donation page: Google Ad Grants For Non-Profits. The Google Ad Grant is available to eligible 501(c)(3)s, and it allows non-profits to advertise on Google! Additionally, the grant is valued at up to $120,000 a year, and it costs the non-profit zero dollars to apply and use. When your non-profit is advertised on the number one website in the world, people are bound see your group and possibly make a donation. Advertising on Google can be a bit confusing, competitive, and time-consuming; which is why we have partnered with non-profit marketing agency, idGrants. They can assist and help you make the most of your advertising on Google. Click here to visit their website!